Cadet James Callen of Leesburg, Va., a freshman majoring in general engineering in the College of Engineering had the opportunity to shadow the 3rd Battalion Commander, Cadet Lieutenant Colonel Joshua Anderson of Suffolk, Va., a senior majoring in biological systems engineering in the College of Engineering as part of the Virginia Tech Corps of Cadets Shadow Day. BLACKSBURG, Va., Nov. 26, 2008 – Cadets in the Virginia Tech Corps of Cadets participated in the annual Shadow Day fundraiser on Wednesday Nov. 5, raising $4,765.50 towards cadet scholarships. The Shadow Day event takes place over three days, after freshmen cadets have had the opportunity to bid to shadow various higher-ranking cadets throughout the regiment. The top bidders shadow their upperclassman for two days to learn about the leadership position they hold. On the last day, the freshmen take over the upperclassmen positions and rank, running the regiment for the day. The Shadow Day event is a Virginia Tech Corps of Cadets tradition dating back over 50 years. Originally termed Turnabout Day, the event designed to be a way to ease the stress of freshmen year in the corps of cadets. However, the event as it stands today began in the fall of 1995. The regimental commander at the time, Jason Sawyer, Virginia Tech Corps of Cadets Class of 1996, developed the idea to make Turnabout Day a more educational event in which the freshmen can have a preview of what it is like to be in a leadership position -- something they will not experience for themselves until their sophomore year. He says got the idea from an experience he had while shadowing a junior officer from the U.S. Air Force during a summer training period. Sawyer says he believed it was a positive experience and thus instituted Shadow Day. Shadow Day raises money for local charities and scholarships. This year the profits of the auction will go to the Matthew J. La Porte and Lauren Smith scholarships. 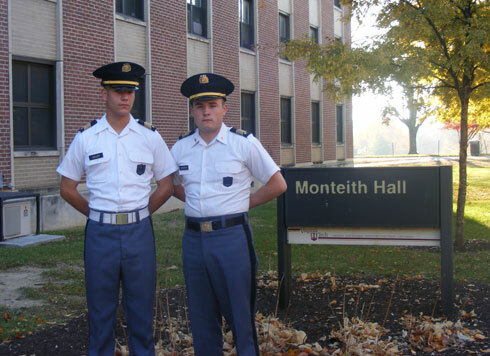 These scholarships are established in the memory of Cadet Matthew J. La Porte, Virginia Tech Corps of Cadets Class of 2009, who died in the April 16, 2007 tragedy, and Lauren Smith, Virginia Tech Corps of Cadets Class of 2007, another cadet who passed away while at Virginia Tech. Written by Cadet Elizabeth Fonseca.